Ahmad Rashad moves on from his divorce from Sale Johnson to Obama adviser Valerie Jarrett. Ahmad Rashad, a Pro Bowl wide receiver, has made yet another great catch. 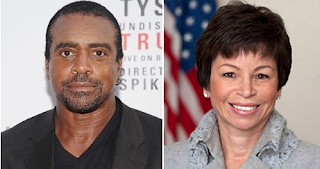 The Minnesota Vikings legend has rebounded from his broken marriage to Sale Johnson — the ex-wife of Jets owner Woody Johnson — and is said to be dating Valerie Jarrett, President Obama’s most trusted senior adviser. Ahmad is a pimp. He definitely a power stroker. I hope its not true but if it is - Valerie run don't trust him he still wants them old wrinkled up rich white women, he don't want to come home to Black women anymore. He will use you to try to get to next to those rich old white widows/divorcees - don't let him near you!! Jordan is his best friend two self hating black men that don't want or like Black women anymore!! RUN! RUN! RUN! Valerie don't do it!! this tragic kneegrow has the morals and principles of snake oil salesman. he's a male gold digger who secretly hates women, he does not respect them. his energy is cold and lifeless. this muthafukka has the sincerity of eddie long. don't do it yourself girl, leave this toxic, rabid feral canine alone.